I had the pleasure of hosting Jason and Shea Johnson from Mississippi at the ranch on Memorial day. 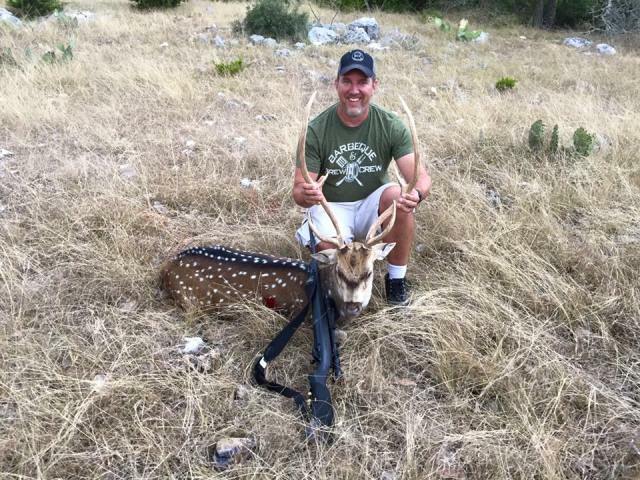 Main focus was Texas Ibex with their bows. 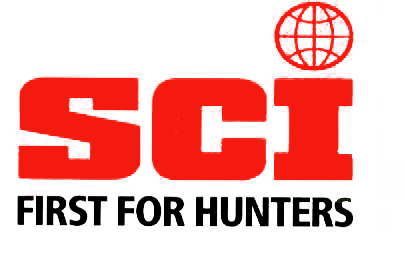 We set out the first evening with the plan to stand hunt for Texas Ibex and I had placed a few new stands in the areas I know the Texas Ibex spend most of their time. So first evening I set Jason and Shae out in separate blinds to cover some ground and hopefully they would have some luck. 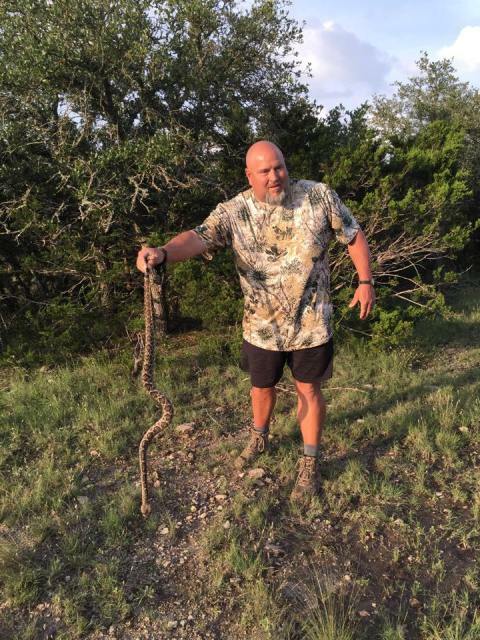 I came back to the house and finished a few chores and then I get a text from Jason ” Got one…following him west bound along 41. I figured I better get in there and we could figure out a plan of attack. Once I found Jason he explained further ” I think I skipped the arrow off the popup blind window when I shot”. Then he proceeded to explain that he lobbed one out at 50 yards or so and hit him low. So we decided to walk the area and try to pick up blood or find him. Lets go back to the 10 days before this hunt and set the scene a little better 11 inches of rain in 10 days and the last 1 3/4 coming the morning they arrived to begin hunting. So now back to real-time. Here we are ankle-deep in mud/water gunk good luck finding blood in this I thought to myself. After a quick walk we jumped the wounded Texas Ibex and although the Texas Ibex looked in bad shape he manged to get out of bow range pretty quickly! 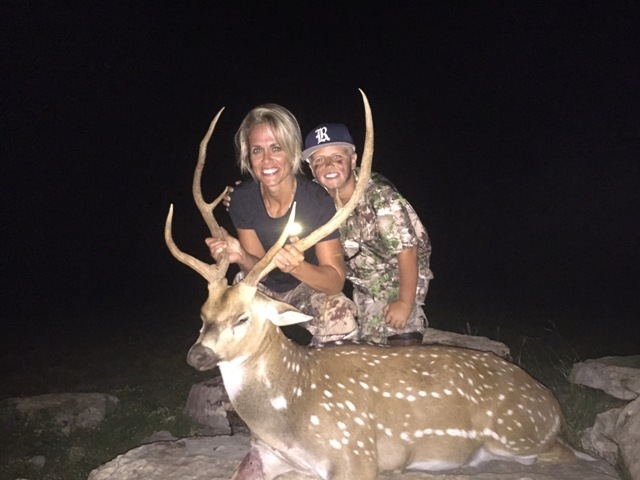 So the decision was made to run back and get a rifle to finish him so he didn’t make it back into the cedar break. After a few minutes I was back with the rifle and Jason had stayed to keep an eye on the Texas Ibex. 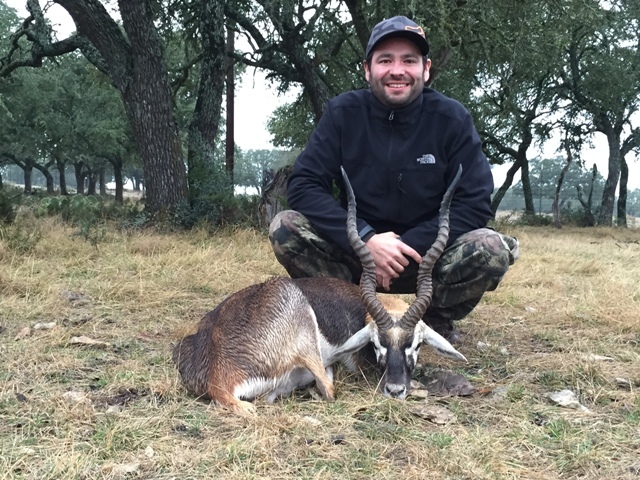 We worked in to about 100 yards and Jason put on a shooting clinic (Nudge Nudge) In the end the Texas Ibex fell and we finally had one in the bag. Knowing we encroached on Shea’s hunting area I figured his day was shot, it was getting late so we stopped and got him from the blind his first question was what the heck is going on!! What was all that shooting about? We quickly explained and made our way to the skinning shed. We made a plan to head back out in the morning. We headed into the pasture at daylight thinking of putting a stalk on a Texas Ibex. We came around a corner of brush and found the herd about 100 yards away from a blind and I decided to put the hunter in the blind and spread some corn and hopefully they would come in and give Shea a shot. I made my way out of the set up and proceeded to get the truck momentarily stuck. So about 15 minute later I watched the herd of Texas Ibex go by my location so I figured they must have cleaned the corn up so I went back to check and see if they got a shot. 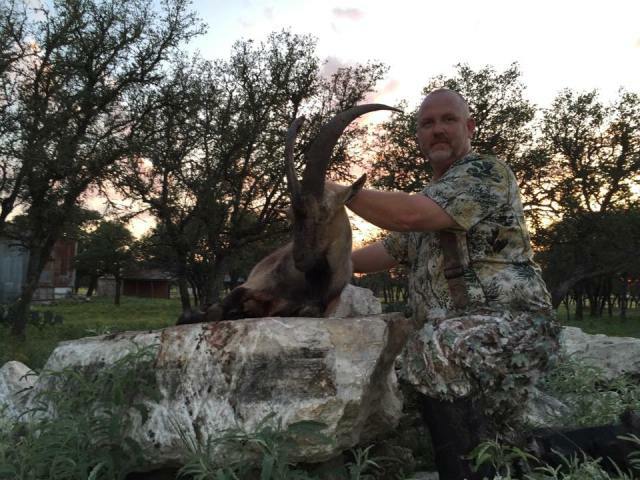 I rounded the corner and Jason was snapping some pics with Shea and his Trophy Texas Ibex he shot at 8 yards. We spent the rest of the day just checking out the ranches we ended up running across this bad boy ! And then a little later Shea had mentioned a ringtail cat being on his bucket list and I told him we should be able to get on one with the light. Took about an hour but we found one. 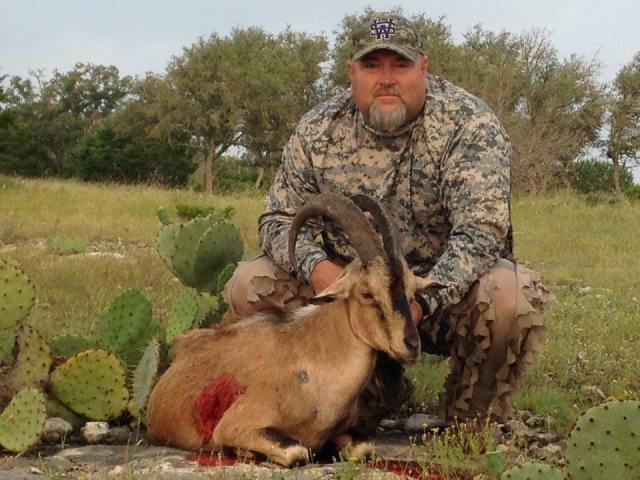 Pretty good hunt and Jason and Shea made their way back to South Mississippi with their Texas Ibex and a ringtail cat. 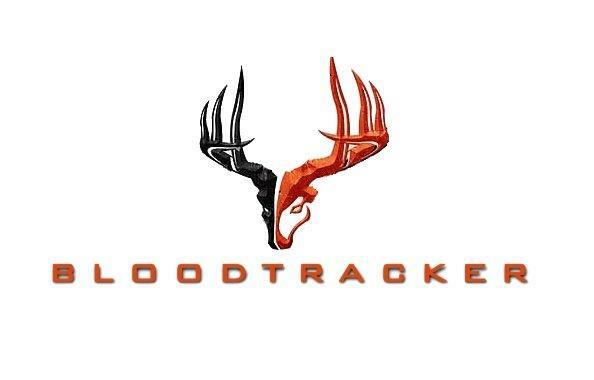 Hope to have them back for Elk hunts at Forister Exotics in 2016! 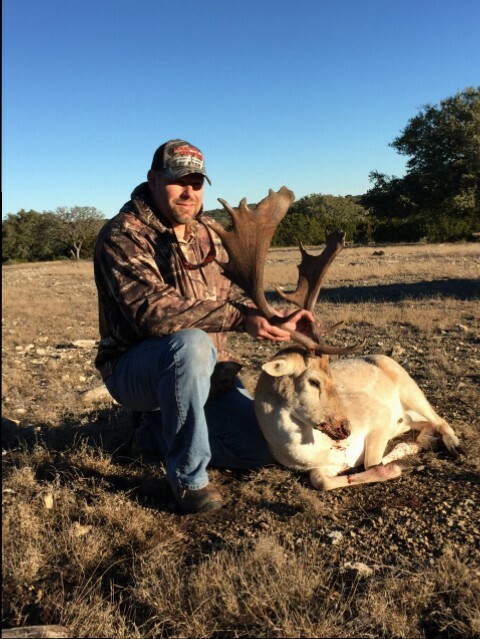 Ryan made his way out to the ranch a few weeks ago looking or a good Fallow Buck to put on his wall. I knew with it being late season we had very few options due to numbers and some of the Fallow bucks already dropping their horns for the year and some of the bigger Fallow bucks being broken up from fighting for their breeding rights. 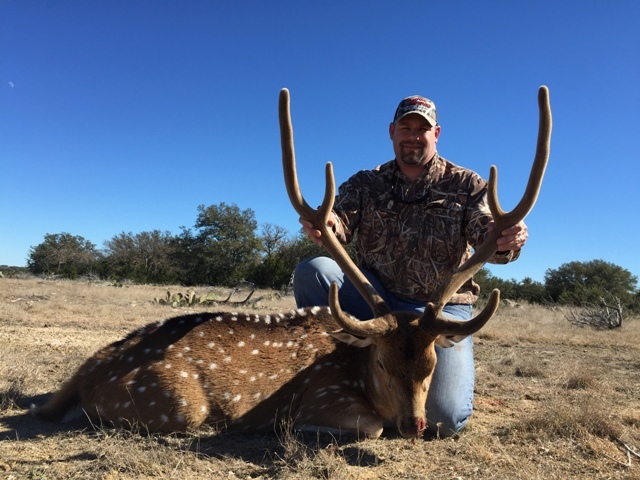 So I had scouted an area of the ranch and found this nice Spotted Fallow Buck coming to a feeder on a very regular basis. I decided to set Ryan and his friend who tagged along in the blind with strict instruction as to which Fallow buck to shoot. So I fed pretty heavy and left them for the morning sit. About 8 I get a text “no show” I replied to hang tight I would come back and feed again and see what we could figure out. So I came and fed corn again and as I left the stand I decided to go back around the back side of the pasture and see what was moving. As I rounded the corner almost a mile away from the feeder Ryan was sitting at there was the Fallow buck with a bunch of doe and a couple other Fallow bucks. I fed corn all on the road and made my way back to get Ryan and try to make a move on the big Fallow Buck. We mad a big loop hoping to come around from the other side of where I had spotted the Fallow. We rounded the corner and at about 200 yards the Fallow deer where feeding on the corn I dropped. Ryan tried to get steady on the jeep and let one fly. Clean miss I could tell from the Fallow bucks reaction. We decided to sit Ryan at a tree that would be probably 100 yards and I would run back through and feed again. As I fed I could see the Fallow Buck up on the ridge where he ran after the ” Warning Shot ” so I knew we might get lucky. I fed again and took off around the loop again. 10 minutes or so had passed and I decided to start working my way back to the area. I knew if it was going to happen it would be quick. As I approached the area I saw the younger Fallow bucks and doe we had seen earlier so I knew Ryan must have gotten a second shot. I come driving down the road and there is Ryan standing over his Trophy Spotted Fallow Buck. I knew we got lucky and Ryan made his second shot count. Congrats Ryan on a nice Trophy Fallow Buck. 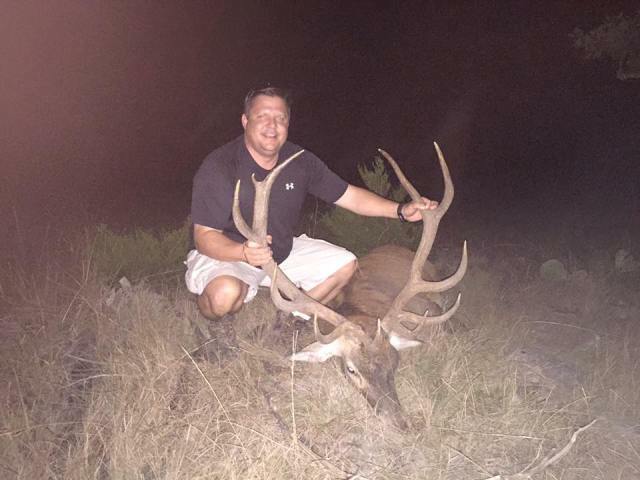 Doug made his way back to the ranch For another go at Red Stag. Being late season I knew the Red Stag Bulls where in hiding so it might be a long hunt. We started by checking a few spots I had been seeing some Red stag Bulls hanging out only to find a couple young red stag and some hinds. We decided to head for the cedar and see if we could flush anything out into the open. After a couple passes we hadn’t seen any Red Stag that fit the bill. As Doug and I where regrouping and driving to another area of the ranch we spotted some Red Stag bulls just slowly walking a ridge going down into a valley. I didn’t have my range finder but I knew they where far. We spotted a Red Stag that Doug wanted to shoot and I cut the truck off as Doug readied for the shot. Doug let the .270 go and down went the Red Stag Bull as we praised the shot the bull got up and moved through the cedar. We made our way down to start trailing what ended up being a very short blood trail. Later after Doug had left I went back and ranged the shot at 350 yards and realized we probably should have tried to get a little closer. 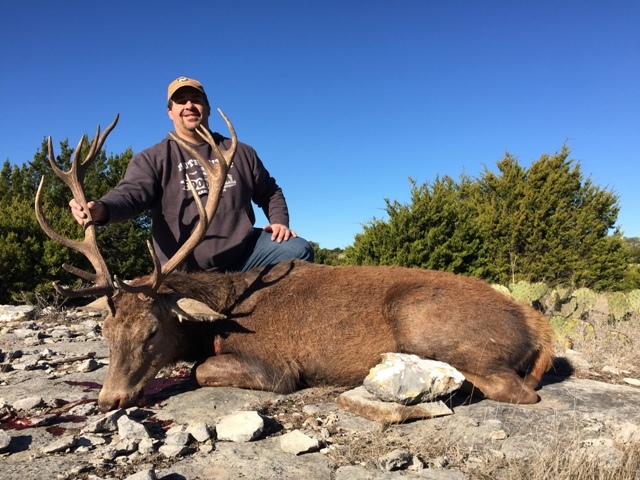 Regardless Doug made a heck of a shot on this Red Stag Bull! 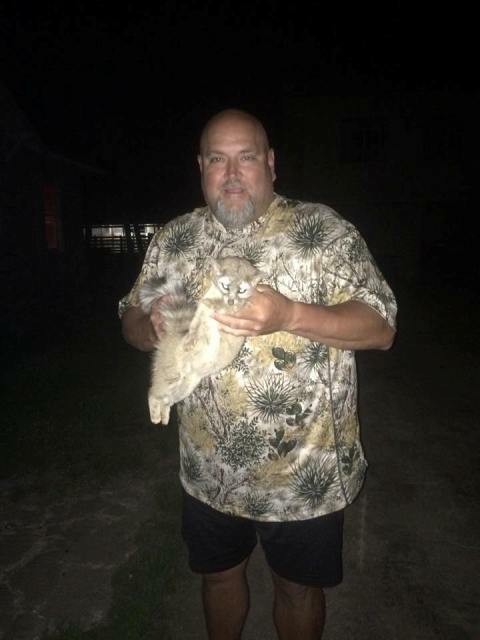 Congrats my friend on another good hunt!